And why are some high-poverty districts in southern Alabama doing so well? 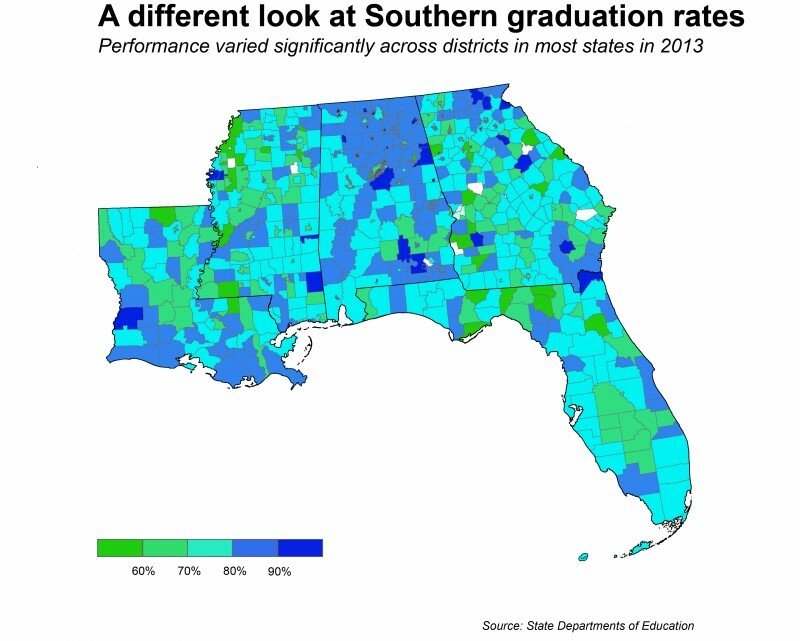 When you look at our national high school graduation rate map, it’s impossible to miss how low graduation rates are in the Deep South. These states don’t have the worst graduation rates in the country. That dubious distinction belongs to Oregon, New Mexico and Nevada. Now, we can start to see some divisions between areas and important distinctions between the states. Let’s start with the not-so-good news. 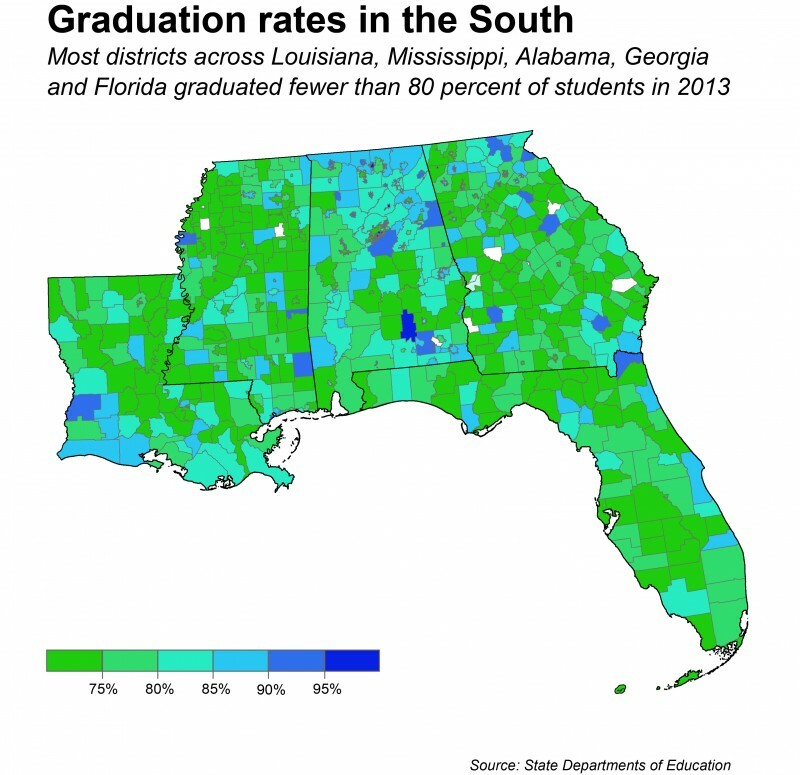 Mississippi and Florida both have more districts with a graduation rate below 60 percent than districts above 90 percent. In fact, Florida only has one district in the northeast corner of the state where 90 percent of students get their diploma within four years. So does Louisiana, along its border with Texas. My first thought was that some of this might be explained by demographics. We know that fewer low-income students graduate from high school than their wealthier peers. 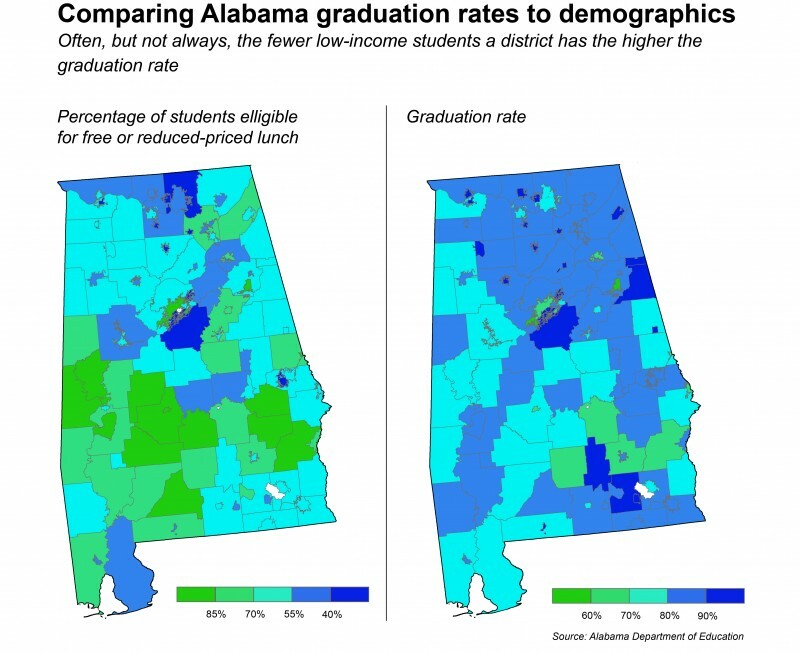 Maybe students in Alabama’s cities are more affluent, while county school districts have more poor students? But here’s a look at the percentage of free and reduced-price lunch eligible students in each district compared with the graduation rate. In theory, the colors should match up somewhat. Districts with high-poverty populations should have low graduation rates and vice versa. You can see that the northern cities do generally have fewer low-income students than the surrounding districts. But the comparison raises other questions. In the southern half of the state, home to most of the high-poverty districts, there are several examples of districts with the highest percentages of low-income students having above average graduation rates. What are these districts doing that is working well? Much of the success can be chalked up to careful collaboration among staff, according to Molly Killingsworth, a regional support coordinator for the state. She works with Perry County Schools, where 93 percent of students were eligible for free or reduced-price lunch in 2013 and 87 percent graduated. Counselors monitor grades, teachers stay on top of interventions and administrators contact parents when needed. Keep checking back as we examine other regions of the United States in the weeks to come. Offer suggestions on places or trends you want to see covered in the comments or on Twitter: @sarahbutro or @hechingerreport. 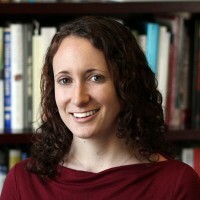 What’s going on with all the missing high school graduation rate data? A high school where teens behave like adults?